First, remove the downspout from your gutter. The attachment piece will replace the downspout as shown in the figure below. This will direct the water flow down the chain. Then, insert the attachment piece from the underside of the gutter where the downspout was previously located. 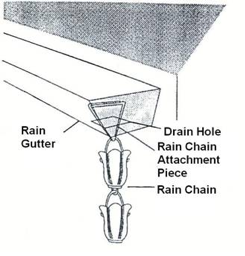 When installing the rain chain, it is necessary to slightly bend the attachment piece by hand or with pliers, in order to adequately secure the rain chain in the gutter. Lastly, attachment piece should point downwards, as shown in the diagram, to complete installation. Must have an actual downspout for Rain Chain to work properly. If you do not have a downspout you will need to use a Gutter Reducer. Gutter Reducer installation directions come with all Gutter Reducer purchases. You must have a 2 3/4 inch hole or larger but no larger than 4 inches.